VideoPlay Blogger Template is Fully Automated Youtube Video Blogger Template. Just put the video iframe in your post, thumbnails will show automatically. 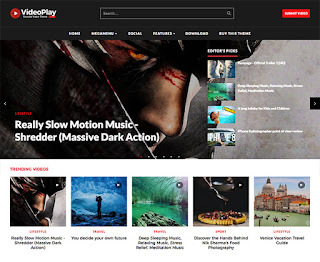 If you have a Youtube Channel and want to show your videos on your website you can use VideoPlay Youtube blogger template for showcasing your videos on your website with ease. This video blogger template will automatically fetch the thumbnails from your videos and will show them as displayed in the demo. VideoPlay is the perfect Video Blogger theme for YouTubers, Video Tutorials, Online Courses and video blogs.